Say the words 'The Ten Commandments' and as many people think of Charlton Heston's classic Hollywood movie as of the original Biblical text given to Moses on Mount Sinai. But what is the real story behind history?s most famous written document? This two-hour special examines the three different biblical accounts of Moses on the Mountain, and then looks at each of the Ten Commandments in its historical context. Adultery, perjury, murder, theft, graven images, Sabbath laws and coveting -- what did they mean then? What do they mean today? Sins like adultery were once punishable by death, but now they are the stuff of tabloid newspapers and reality TV. What were once considered graven images are now worshipped as priceless works of art. In ancient times, people believed breaking these taboos could destabilize their entire community. Now the values that they embody are often derided by 'modern' society. This film also examined the other 603 commandments that Moses prescribed: laws that took a backseat to the more famous first ten. What was in these commandments and why have they been largely forgotten? 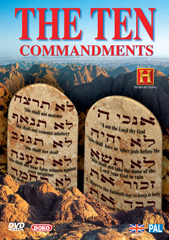 Legal, religious and historical scholars, including world famous author Alan Dershowitz and Old Testament expert Daniel Smith-Christopher, reveal how the issues raised by the Ten Commandments have been viewed ? and punished ? throughout history. From ancient times, via Medieval and Puritan days, though to our own modern age, this film explores how some definitions, laws and morality itself have changed while some remained the same ? still defined by history?s first and most formidable ?Top Ten? list.